Visiting Hours Jordan Valley Medical Center welcomes families and friends to visit with patients at the hospital. We understand that having loved ones nearby can improve healing and help facilitate better care. Hours vary by unit. About Jordan Valley Medical CenterSubstantial investment in advanced technology and state-of-the-art equipment has helped the hospital attract a top-notch medical staff and a team of highly-skilled nurses. The entire hospital team is dedicated to providing expert medical care in a warm, family-friendly environment. Whether it’s a broken bone, a deep cut that needs stitching, or something more serious, we’re prepared to take care of your medical needs 24 hours a day, seven days a week. Our board-certified emergency room doctors and nurses are always here to handle a medical crisis with timely, high-quality treatment. Jordan Valley Medical Center in West Jordan UT was recently awarded as Women's Choice Award for America's 100 Best Hospitals Emergency Care. We are the only designated trauma center west of I-15 in the Salt Lake Valley and have invested substantially in the community through the acquisition of state-of-the-art medical equipment to better serve our patients. We are committed to providing rapid, high-quality trauma care to our local communities, in close partnership with our local EMS agencies and police departments. What Should I Expect At The Jordan Valley ER? When you arrive, a registered nurse will conduct an initial exam, take your vital signs and complete a brief medical history. Triage helps us determine the severity of your emergency and allows us to take care of the most urgent cases right away. That’s why someone who arrives after you may be treated before you. We work to see everyone as quickly as possible and we attend to the most critical needs first. During registration, we will ask you to sign a treatment consent form and to provide your name, address, phone number, personal physician and insurance information. For your convenience, if an exam room is available, a registration clerk will gather this information at your bedside. If a room is not available, and your emergency is not life-threatening, you may be asked to remain in the reception area until a room is ready for you. Once you are in the treatment area, a physician will examine you and order any tests needed to evaluate your condition. Depending on the type of illness or injury, a nurse may start an IV or obtain a blood or urine sample, or you may undergo diagnostic tests, such as X-rays or a CT scan. Our goal is to keep you comfortable and conduct tests as quickly as possible. Some tests take longer to complete, and we appreciate your patience as we work to provide you with the most prompt, courteous, and comprehensive emergency care we can offer. Your treatment will depend on your physician’s orders after the medical evaluation is complete. Our staff will keep you informed about what to expect during every part of the treatment process. 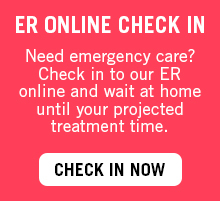 Most patients are treated and discharged to go home from the emergency room. If you are admitted to the hospital, you will be transferred to a patient room and we will notify your primary care physician. If you do not have a physician, a physician on our staff – called a hospitalist – will coordinate your care while you’re at the hospital. If your emergency room physician determines you can go home, you will receive written instructions about how to take care of yourself after you leave the hospital. It is important to follow these instructions, take all prescribed medications and schedule a follow-up appointment with your personal physician. If you have questions about your discharge instructions, please ask your nurse. Signs & Symptoms of a Heart Attack: Are You at Risk? A medical emergency, such as a heart attack, can strike unexpectedly; however, the quick thinking and actions of you or others can initiate the emergency response process and potentially save a life.